1889 Nasseredin Shah's visit to England Empire Theatre: A page trimmed from The Graphic (a leading illustrated British news magazine of the day), July 13, 1889. 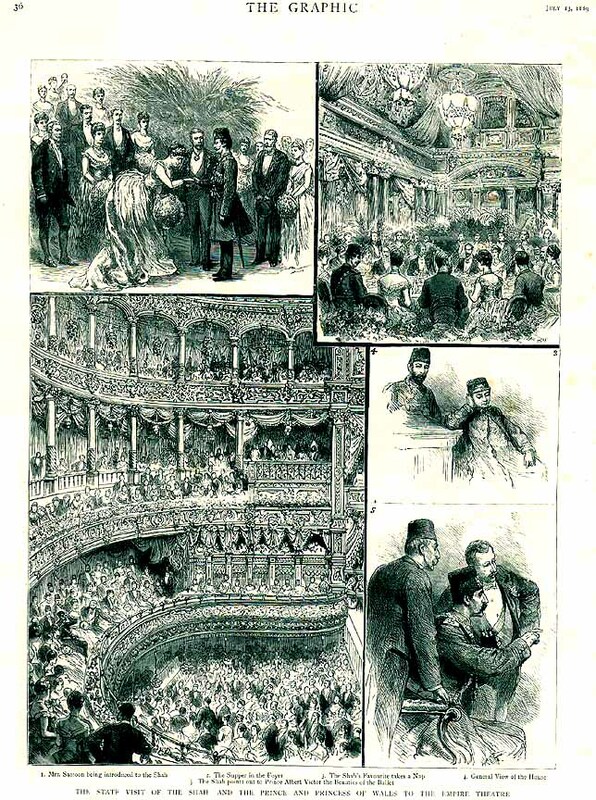 [Larger image] The title is "THE STATE VISIT OF THE SHAH AND THE PRINCE AND PRINCESS OF WALES TO THE EMPIRE THEATRE", and it features a nice collage of illustrations of this particular visit. Notice comment for picture 3: "Shah's favorite takes a nap": Malijak immortalized by actor Parviz Fannizadeh in the classic film "Soltaneh Sahebgaran" about Nasseredin Shah Qajar.